Scaevola ‘Aussie Salute’ is a cultivar of the well known Scaevola. aemula. This handsome, upright variety reaches a height of 40 centimetres with a spread of 50 centimetres. The lobed leaves are up to ten centimetres long and light green. During spring and summer plants become covered with large, purple-blue fan-shaped flowers. An “Aussie Salute” in full flower is an eye-catching horticultural spectacle. 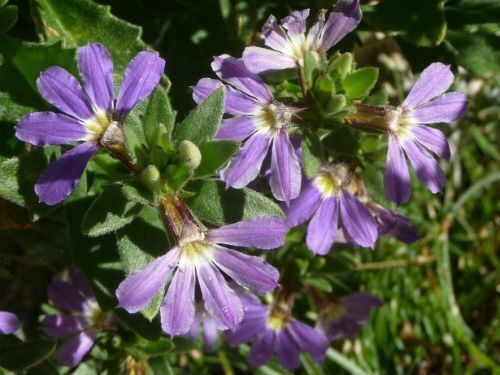 Scaevola ‘Aussie Salute’ could be grown in containers, rockeries and native cottage gardens. Light pruning, after flowering, will keep plants dense and blooming bounteously. In our cold climate garden, we have found that plants need to be heavily mulched and watered regularly during the warmer summer months. Scaevolas propagate rapidly from cuttings. Scaevola aemula has given rise to many named cultivars. They are popular in cultivation overseas where cultivars are treated as annuals and grown in hanging baskets and containers. We saw Scaevolas growing around the base of a fountain in Florence, Italy. The genus name means little hand and refers to the flower shape.